1. Department of Orthopaedic Surgery, Renji Hospital, School of Medicine, Shanghai Jiaotong University, Shanghai 200127, P.R.China. 2. Department of Endocrinology, Renji Hospital, School of Medicine, Shanghai Jiaotong University, Shanghai 200127, P.R.China. Objectives: Skeletal development is a complex process. Little is known about the different response of limb or spine growth plate chondrocytes (LGP or SGP) to the estrogen level and the role of estrogen receptor (ER) during postnatal stage. Methods: LGP and SGP chondrocytes were isolated from 50 one-week mice and treated with different concentrations of 17β-estradiol. Cell viability was measured by cell counting kit-8 (CCK-8). The expression of collagen II and X were evaluated by real-time PCR and Western blotting. Then, the response of LGP or SGP chondrocyte after with or without estradiol and specific ER antagonists to block the effect of ERs were also measured by Western blotting and immunofluorescence. Results: Estradiol promoted the chondrogensis of the chondrocytes in vitro and achieved the maximal expression of type II collagen at the dose of 10-7 M. Additionally, the regulatory effect of estradiol on the chondrogenesis can be mainly relied on ERα. The LGP chondrocytes were more sensitive to the estradiol treatment than SGP in the expression of type II collagen. Conclusions: Estrogen at a pharmacological concentration (10-7 M) could stimulate the maximal production of type II collagen in the growth plate chondrocytes in vitro, which exerts its activity mainly through ERα in the chondrogenesis. Furthermore, the LGP chondrocytes were more sensitive to the estradiol treatment than SGP in the chondrogenesis. Keywords: limb, spine, growth plate chondrocyte, postnatal stage, estradiol, estrogen receptor. Endochondral bone formation at the epiphyseal growth plate, as the pivotal role in the skeletal development, is a complex process consisting of cartilage formation and replacement of cartilage with bone tissue [1, 2]. This dynamic process is closely modulated by a variety of hormones and endocrine signals. Among these, estrogen plays a significant role and exerts its action through two nuclear receptors, namely estrogen receptor α (ERα) and β (ERβ), in skeletal growth for both genders . The effects of estrogen on the skeleton mainly occur via interactions with its receptors ERα and β. Some investigations have reported the expression of ERα and ERβ in all zones of the growth plate in humans as well as rats [4-6]. However, it has been indicated that ERβ can antagonize ERα activity with a “yin yang” association between them in some species and tissues. In our previous study, we demonstrated the dynamic variations of estrogen receptor α and β expression in the growth plate of spine and limb during development . Interestingly, Vidal et al. indicated that the actions of ERα on the bone growth may differ between spine and limb. The studies with specific ER knockout mice reveal differential roles of ERα and β resulting in regulation of linear growth [9-11], however, the conflict still existed and further evidence is required to determine the respective roles of the ERs. In the present study, the viability analysis and collagen expression levels in the limb or spine growth plate chondrocytes of female C57BL/6 mice were investigated, to analyze the effect of estradiol with different concentration on the biological characteristics of growth plate chondrocytes through the meditative effects of ERα or β. This may enable further understanding of different response characteristics of axial or appendicular growth plate chondrocytes to estrogen, as well as the mechanisms of physiological and pathological changes in the development of bone growth. Dulbecco's modified Eagle's medium and Ham's F-12 medium (DMEM/F12; Hyclone), fetal bovine serum (FBS; Gibco), penicillin-streptomycin (Invitrogen), 17β-Estradiol (Sigma-Aldrich), ERα antagonist methyl-piperidino-pyrazole (MPP; Sigma-Aldrich), ERβ antagonist 4-[2-phenyl-5,7-bis (tri-fluoro-methyl) pyrazolo [1,5-a] pyrimidin-3-yl] phenol (PHTPP; Sigma-Aldrich), dimethyl sulfoxide (DMSO; Invitrogen), Rabbit polyclonal antibody to Col II (Abcam) and Col X (Abcam), Rabbit polyclonal antibody to GAPDH (Abcam). Estradiol, MPP, and PHTPP were dissolved in DMSO according to manufacture protocol. To confirm the effect of culture period on the cell viability in the low concentration FBS (0.5%) without estradiol, the cell viability was measured using Cell Counting Kit-8 (CCK-8; Dojindo Molecular Technologies, Kumamoto, Japan) according to the manufacturer's instructions. Limb and spine growth plate chondrocytes (5×103 cells/well) were seeded in 96-well flat-bottomed plates and incubated in 100 µl of complete culture medium for several time points (day 1 to 5). Each treatment was repeated in six wells. As soon as the treatments were completed, 10µl solution from CCK-8 was added to 100µl culture media each well. These plates were continuously incubated for 2 hours in a humidified CO2 incubator at 37°C. Finally, the absorbance of the sample taken from each well was measured by microplate reader (Bio-Rad, Hercules, CA, USA) at 450nm. Cell viability was expressed as percentage of viable cells relative to untreated cells, using absorbance at 450nm. To further investigate the effect of estrogen with different concentrations on cell growth, cell viability of growth plate cells was also determined by CCK-8. Various concentrations of estrogen (0+DMSO, 10-6, 10-7, or 10-8 M) were added to the medium and incubated for various time points. Similar protocols above were made again to detect the proliferation. The cells were initially plated in six-well plates (Corning, New York,NY, USA) at a density of 6×104 cells/well and incubated at 37 ℃ in 5% CO2/95% humidity. For starvation, cells were cultured with DMEM/F12 containing 0.5% FBS for 12 h after reaching 70-80% confluency and then made the further stimulation with estradiol. To investigate the role of estradiol treatment with different concentrations in the chondrocytes, various concentrations of estrogen (0, 10-6, 10-7, or 10-8 M) were added for several time points after starvation. To further demonstrate the effect of ERs on the chondrocytes of limb and spine, the corresponding antagonists were utilized to block specifically the effect of ERs. The chondrocytes from limb or spine, with or without optimal concentration of estradiol treatment, were treated with MPP (1 μM) and PHTPP (1 μM) to block the ERα and ERβ for maximal period, respectively. Finally, chondrocytes were harvested for real-time PCR analysis and Western blotting. Total RNA was isolated from lysates of growth plate chondrocytes of spine and limb using the standard TRIzol method according to the manufacturer's instructions (Invitrogen, Shanghai). The process of RNA reverse transcription was accomplished using PrimeScript RT reagent Kit (TaKaRa, Japan). In order to quantify the transcripts of the corresponding genes, quantitative real-time PCR was performed using a SYBR Green Premix Ex Taq (Takara, Japan) on Light Cycler480 (Roche, Switzerland). Target gene mRNA level was normalized to that of β-actin in the same sample. The cycle threshold (Ct) values were collected and normalized to the housekeeping gene β-actin. The ΔΔCt method was used to calculate the relative mRNA levels of each target gene. All RT reactions, including β-actin controls, were run in triplicate. The primer sequences used were listed as follows: Col II, Forward 5'-GGTGGAGCAGCAAGAGCAA-3'; Reverse 5'-CGTCGCCGTAGCTGAATGT-3'; Col X, Forward 5'-AGAACGGCACGCCTACGAT-3'; Reverse 5'-CTGTGAGCTCCATGATTGCA-3'; β-actin, Forward 5'-CATCCGTAAAGACCTCTATGCCAAC-3'; Reverse 5'-ATGGAGCCACCGATCCACA-3'. Protein was extracted from cells by RIPA buffer plus protease inhibitors. Equal amounts of protein were separated by 8% SDS-PAGE and transferred to the NC membrane. After blocking by non-fat-dried milk, the membrane was incubated with diluted primary antibodies overnight, followed by incubation with secondary antibody. Western blotting was performed using antibodies against Col II, Col X and GAPDH. Protein expression levels were quantified with the use of Image J software (Bethesda, MD, USA). Quantitative densitometric values of each protein were normalized to GAPDH. For immunofluorescence detection, 1×104 limb or spine growth plate chondrocytes, with or without 10-7 M E2 treatment, were plated onto microscope slides in the medium and treated with MPP (1 μM) or PHTPP (1 μM) to block the ERα and ERβ, respectively. The slides were washed three times in PBS, fixed in 4% paraformaldehyde for 20 minutes, permeabilized in 0.1% Triton X-100, and exposed to the indicated primary antibodies overnight at 4 °C. After exposure to secondary antibodies and counterstaining with DAPI, cells were visualized under a fluorescence microscope (Olympus Corp, Tokyo, Japan). All data were expressed as the means and standard deviation (SD). Data analysis was performed using analysis of variance (ANOVA) with the Student-Newman-Keuls post hoc analysis or unpaired t test. Differences with P < 0.05 were considered statistically significant. All statistical tests were performed using the SPSS 17.0 statistical package (SPSS, Chicago, IL, USA). The isolated growth plate chondrocytes of limb and spine were cultured in DMEM/F12 containing 0.5% FBS for 1 to 5 days after starvation. Cell viability was measured by CCK-8 assay. As shown in Figure 1A and 1B, cell viability was gradually increased from day 1 to day 3 both in limb and spine growth plate chondrocytes. However, it was significantly decreased from day 4 and day 5. The results indicated that day 3 was the peak of the cell viability both in limb and spine growth plate chondrocytes. Considering cell viability and cell status may influence the results, chondrocytes that cultured for 3 days were used in the following experiments. The cell viability of isolated limb and spine growth plate chondrocytes were measured after stimulating by estradiol with different concentrations (0, 10-6, 10-7 and 10-8 M). Of note, the cell viability of limb and spine growth plate chondrocytes were enhanced by estradiol treatment with the days of culture. Moreover, the addition of estradiol may increase the cell viability of both limb and spine growth plate chondrocytes and the peak of cell viability was reached at the concentration of 10-7 M (Figure 1C and 1D). The expression of Col II and Col X were measured with the prolonging of cultured time. The results of real-time PCR showed that the relative gene expression of Col II and Col X were significantly increased across from day 1 to day 3, in both limb and spine growth plate chondrocytes (Figure 2A and 2B). Results of western blot also presented the same trends. In the limb growth plate chondrocytes, the proteins of Col II were remarkably increased in day 2 and day 3, compared with day 1. Moreover, the protein expression in day 3 reached the highest level. In the spine growth plate chondrocytes, the protein expression of Col II was much higher in day 3 than day 1 and day 2 (Figure 2C and 2E). In addition, the protein expression of Col X got the peak in day 3 in both limb and spine growth plate chondrocytes (Figure 2D and 2F). These results indicated that the expression of Col II and Col X were increased with culture time in both limb and spine growth plate chondrocytes. The cell viability analysis of growth plate chondrocytes from limb and spine. (A) (B) The expression of CCK-8 in the growth plate chondrocytes from limb and spine under the condtion of low concentration FBS with the days of culture to detect the optimal culture period. * P<0.05 versus day 1. (C) (D) The expression of CCK-8 in the growth plate chondrocytes from limb and spine with different concentrations of estradiol during the optimal culture period. * P<0.05 versus concentration 0. The dynamic expression of Collagen II and Collagen X in limb and spine growth plate chondrocytes under the circumstance of low concentration FBS with the days of culture. (A) (B) Real time PCR analysis of relative gene expression showing Col II or Col X in limb and spine growth plate chondrocytes with the days of culture. *p<0.05; (C) (D) Western blot analysis showing Col II or Col X expression in limb and spine growth plate chondrocytes with the days of culture; (E)(F) Relative protein expression of Col II or Col X in limb and spine growth plate chondrocytes with the days of culture. *p<0.05. The expression of Collagen II and Collagen X in limb and spine growth plate chondrocytes with different concentrations of estradiol. (A) (B) (C) Real time PCR analysis showing relative gene expression of Col II or Col X in limb and spine growth plate chondrocytes with different concentrations of estradiol. *p<0.05; (D) (E) (F) Western blot analysis showing Col II or Col X expression in limb and spine growth plate chondrocytes with different concentrations of estradiol. *p<0.05; (G)(H)(I) Relative protein expression of Col II or Col X in limb and spine growth plate chondrocytes with different concentrations of estradiol. *p<0.05. Both limb and spine growth plate chondrocytes were stimulated by estradiol with different concentrations (0+DMSO, 10-6, 10-7 and 10-8M) under the condition of low concentration FBS after cell starvation. The expressions of Col II and Col X were further measured with different doses of estrogen. The results of PCR showed that relative gene expression of Col II reached the peak at the dose of 10-7M of estrogen both in limb and spine growth plate cells (Figure 3A). The results were also confirmed by western blot (Figure 3D and 3G). 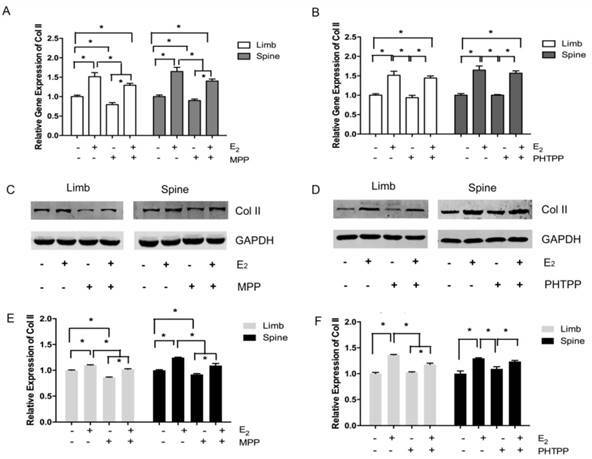 Moreover, the gene expression of Col X was also highest in the dose of 10-7M in limb growth plate cells but not obvious in spine growth plate cells (Figure 3B). The protein expression of Col X presented insignificant difference according to the different levels of estradiol. The results indicated that estradiol may have more significant effect on the expression of Col II and the optimal concentration of estrogen may be 10-7M. Furthermore, the optimal dose of estradiol was confirmed by PCR and western blot. To investigate the different response of growth plate chondrocytes from limb and spine to estradiol treatment, we utilized the optimal concentration of estradiol as the stimulation. After 3 day-stimulation of estradiol at the dose of 10-7 M, the gene and protein expressions of Col II were significantly increased in both limb and spine growth plate chondrocytes. Besides, the increase of Col II in the limb growth plate chondrocytes was more notable than that in spine growth plate chondrocytes (Figure 3C, 3F and 3I). This founding revealed that the appendicular growth plate chondrocytes were easier to increasing the production of type II collagen compared with axial chondrocytes after the optimal estradiol treatment. In the limb growth plate chondrocytes, the addition of estrogen resulted in the increase of gene and protein expression of Col II. However, the addition of MPP, an inhibitor of ERα, induced the remarked decline of Col II expression both in gene and protein level. However, the further addition of estradiol may relatively increase the expression of Col II, but still lower than the group that stimulated with estradiol only. In the spine growth plate chondrocytes, the results were similar with limb chondrocytes (Figure 4A, 4C and 4E). The effect of ERα inhibitors was further identified by immunofluorescence staining. In both limb and spine growth plate chondrocytes, the expression of Col II was significantly increased after the addition of estrogen. However, the addition of MPP inversely decreased the expression of Col II. The condition was still obvious even after the further addition of estradiol (Figure 5). 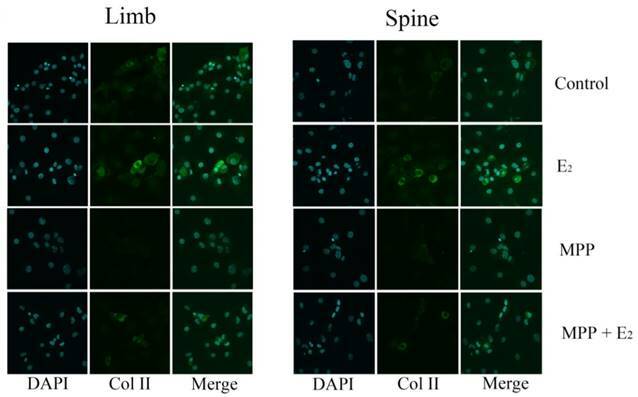 The expression of Collagen II and Collagen X in limb and spine growth plate chondrocytes with ERα or ERβ inhibitors. 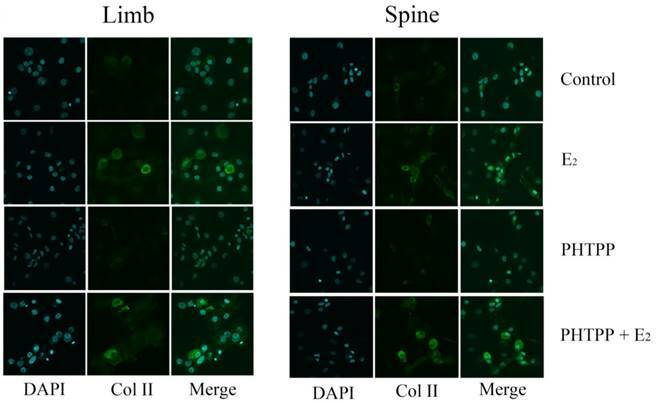 (A) (B) Real time PCR analysis showing the relative gene expression of Col II in limb and spine growth plate chondrocytes with ERα or ERβ inhibitors. *P<0.05; (C) (D) Western blot analysis showing Col II expression in limb and spine growth plate chondrocytes with ERα or ERβ inhibitors; (E) (F) Relative protein expression of Col II in limb and spine growth plate chondrocytes with ERα or ERβ inhibitors. *P<0.05. Immunofluorescence staining in the growth plate chondrocytes from limb and spine with ERα inhibitor. The expression of Col II in limb and spine growth plate chondrocytes after the addition of E2 with/without MPP. E2: estradiol; MPP: estrogen receptor α (ERα) inhibitor. Immunofluorescence staining in the growth plate chondrocytes from limb and spine with ERβ inhibitor. The expression of Col II in limb and spine growth plate chondrocytes after the addition of E2 with/without PHTPP. E2: estradiol; PHTPP: estrogen receptor β (ERβ) inhibitor. The effect of PHTPP, as an inhibitor of ERβ, was also tested in this study. 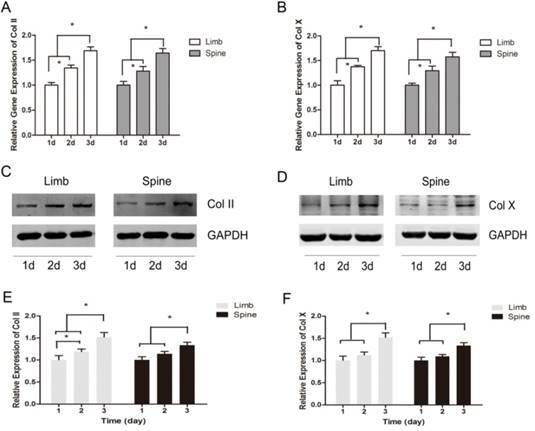 In contrast to the results of MPP, the effect of PHTPP was insignificant on the gene and protein expression of Col II in both limb and spine growth plate chondrocytes (Figure 4B, 4D and 4F). The results of immunofluorescence staining also suggested that PHTPP may not play an important role in the expression of Col II since the addition of PHTPP not influence the level Col II before and after the further addition of estradiol (Figure 6). It is well known that estrogen and its receptors play the significant roles in bone growth, but the effect of estrogen receptors (ERα and ERβ) on mediating bone growth is still unclear. Several investigations have shown that estrogen receptors existed in the growth plate cartilage of both male and female mice . Our previous study also indicated that both ERα and ERβ were dynamically expressed during chondrocyte differentiation via histological analysis . In the present study, we used the primary chondrocytes of growth plate to investigate the ability of estrogen and its receptors to regulate the cell proliferation and chondrogenesis between appendicular and axial growth plate chondrocytes during growth. To our best knowledge, this study is the first to shed light on the effects of estrogen with different concentrations on the cell viability and matrix expression in axial and appendicular growth plate chondrocytes. Some studies indicated that serum may result in confounding effects on estrogen or allow estrogen to work in concert with other factors in the supplemented media [14, 15]. Thus, we have used the in vitro phenol red-free cell culture with low dose serum to isolate the effect of estrogen on growth plate chondrocytes at postnatal stages in the present study. The cell viability of primary chondrocytes was validated in culture medium with low-concentration FBS in the CCK8 analysis and was shown to maintain the sufficient viability in a relevant chondrogenic progression at 3-day over a 5-day duration. Furthermore, we found that the type II collagen generated by limb and spine growth plate chondrocytes without estrogen treatment showed significantly increased expression in a time-dependent manner with time. Similarly, the type X collagen also presented slightly increased. Thus, the cells were added with estrogen after achieving 70-80% of cell confluency and then examined whether the changes in the collagen were enhanced by estrogen treatment during 3-day period, a time when the primary chondrocytes were less influenced by cell viability and expressed a large amount of type II and type X collagen during the proliferative stage. As we known, type II collagen, the predominant extracellular matrix in the proliferating stage, can be utilized as an effective indicator to investigate the chondrogenesis development [16-19]. Meanwhile, the expression of type X collagen is the typical features of chondrocyte hypertrophy [20-24]. These observed indicators were commensurate with previously reported results, and were adopted to measure the chondrogenesis process [25-29]. The results of present study has demonstrated that estrogen can promote cell proliferation and increase extracellular matrix expression of axial and appendicular growth plate chondrocytes during postnatal development, especially type II collagen expression. Although our study showed that estrogen treatment had different influences on type II and Type X collagen expression in the growth plate, we speculated that estrogen might upregulate type X collagen expression for a long period. Experiments with the condylar cartilage of the rat mandible showed that estrogen has the ability to lead to a decrease in extracellular matrix in organ culture , while estrogen downregulation could produce an acceleration of type II collagen degradation in articular cartilage in ovariectomized rats . Estrogen could stimulate the maturation of growth plate chondrocytes and promote the production of type X collagen . Nevertheless, the effect of estrogen on type II and type X collagens expression remains controversial. The different levels of estrogen we selected based on the previous research [15, 32, 33]. Physiologic concentrations of estrogen without serum appeared to have no effect on chondrocyte proliferation, or viability. Claassen et al. also reported that incubation with physiological dose of estradiol alone did not significantly influence collagen II synthesis in their study of cow chondrocytes. In the current study, estrogen with concentrations increasing from 0 to 10-6 M has induced a dose-dependent change with parabolic curve in the levels of type II collagen. Interestingly, estrogen at a pharmacological concentration (10-7 M) is able to promote the maximal changes of type II collagen. The data concerning the inhibitor of estrogen receptors in the present study showed that estrogen treatment had distinct effects on type II collagen gene expression in endochondral ossification via ERα, but not ERβ. 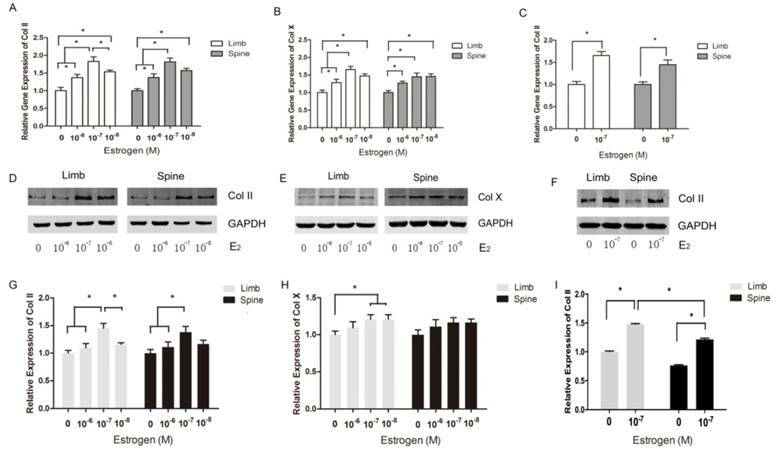 Previous studies have reported that ERα mediated important effects of estrogen in the skeleton of male mice during growth and maturation . Additionally, ERβ might counteract the stimulatory action of ERα on bone formation in mice . However, the inhibitory phenomenon was not detected after adding the inhibitor of ERβ in this study, which suggest that ERβ may be not important for bone growth during postnatal stage before puberty. Ikeda et al. suggested that ERα is a critical regulator of chondrocyte proliferation and maturation during skeletal development, mediating longitudinal bone growth in vivo. Besides, Bord et al. also suggested that ERα is evident in cortical bone and ERβ is the dominant form in cancellous bone in neonatal period. ERβ is capable of inhibiting ERα-activated transcription from estrogen response elements at low levels of estrogen. In contrast, at high levels of a ligand, ERβ does not inhibit ERα action and it induces its own transcription . Therefore, ERβ at different concentrations of estrogen may result in different effects. Chagin et al. observed a differential effect between ERα and β on the growth plate, postulating that ERβ is possibly more important in regulating female epiphyseal fusion. In the ERβ knockout mice, it has been reported that adult females exhibit changes in cortical bone, whereas prepubertal and male mice are uninfluenced . Windahl et al. suggested that ERβ was involved in both the regulation and maintenance of cancellous bone in female mice, whereas Sims et al. postulated that ERα was required for normal cortical bone growth in males, although in females ERβ could compensate for the loss of ERα. As discussed above, the reported ability of ERβ for bone growth adds complexity to the interpretation of these experiments and the “yin yang” relationship between them should be studied and confirmed further. Based on our data, the appendicular growth plate chondrocytes were more prone to increasing the production of type II collagen compared with axial chondrocytes following the estrogen treatment. Li et al. found spatial expression differences of ERα and β protein were detected during all observed developing stages in both spine and limb growth plate. Moreover, Vidal et al. reported the decreased length of appendicular skeleton with approximately normal axial skeleton in the female mice with inactivated ERα, which also indicate that the effect of ERα on the regulation of the growth plate of limb and spine seems to be region-specific. Along with the indirect effects of estrogen on skeletal growth via modulation of the growth hormone/insulin-like growth factor 1 (GH/IGF-I) axis, other effects may be direct [1, 42]. This should be considered as a significant part of skeletal development, because further mechanism may facilitate the understanding of region-specific development. This study may provide in vitro evidence that appendicular-growth plate chondrocytes may be more sensitive to estrogen treatment directly than the axial chondrocytes in the early life. Regulation of bone growth by estrogen is complicated. Estrogen at a pharmacological concentration (10-7 M) could stimulate the maximal production of type II collagen in the growth plate chondrocytes in vitro, which exerts its activity mainly through ERα in chondrogenesis. Furthermore, the limb growth plate chondrocytes were more sensitive to the estradiol treatment than those of spine in the chondrogenesis. The action mechanisms on the different response of limb and spine growth plate chondrocytes to estrogen and its receptors should be further studied. ER: estrogen receptor; LGP: limb growth plate; SGP: spine growth plate; FBS: fetal bovine serum; DMEM/F12: Dulbecco's modified Eagle's medium and Ham's F-12 medium; MPP: methyl-piperidino-pyrazole; PHTPP: 4-[2-phenyl-5,7-bis (tri-fluoro-methyl) pyrazolo [1,5-a] pyrimidin-3-yl] phenol; DMSO: dimethyl sulfoxide; Col: Collagen; PBS: phosphate-buffered saline; CCK-8: Cell Counting Kit-8. This study was supported by the National Natural Science Foundation of China (81270027, 81271941, 30901508). Also thanks for Dr. Bo Yu for giving technical advice and support. Corresponding authors: Prof. Xin-Feng Li, Department of Orthopaedic Surgery, Renji Hospital, School of Medicine, Shanghai Jiaotong University, Shanghai 200127, P.R.China. Tel. : (86)21-68383766; fax: (86)21-63730455. Email address: rjlixinfengcom (X.-F. Li). Prof. Zu-De Liu, Department of Orthopaedic Surgery, Renji Hospital, School of Medicine, Shanghai Jiaotong University, Shanghai 200127, P.R.China. Tel. : (86)21-58752345 ext. 3700; fax: (86)21-63730455. Email address: rjliuzdcom (Z.-D. Liu).